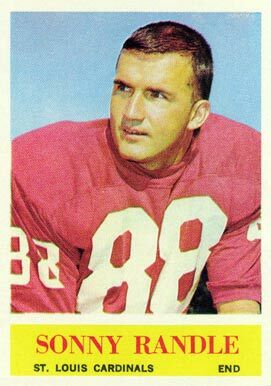 1964 Philadelphia football card of former pro football receiver Sonny Randle, who played 10 seasons in the NFL with his most productive years spent with the Cardinals franchise in Chicago and St. Louis. He was a four-time Pro Bowler and was named All Pro in 1960 (when he led the NFL in touchdown receptions) and 1962. After retiring as a player, Randle enjoyed a 13 year career in college coaching at 4 different schools, including head coaching stops at Virginia and Marshall. He also dabbled in sports broadcasting, and even started his own talk radio network in his native Virginia. Randle died in 2017 at the age of 81.